Reel Talk Online: DVD Review: "Alice in Wonderland"
DVD Review: "Alice in Wonderland"
"There is a place. Like no place on Earth. A land full of wonder, mystery, and danger! Some say to survive it: You need to be as mad as a hatter." The story of a young girl falling down a rabbit hole and shrinking to a few inches tall then meeting a bunch of questionable characters, including a very punctual bunny and a mad hatter, could only be someone's LSD trip or Tim Burton's inspiration for his latest film, Alice In Wonderland. Luckily for us, no one had to take any drugs in the making of this movie (that we know of). Ripped straight from Lewis Carroll's famous 1865 novel Alice's Adventures in Wonderland, Tim Burton added his signature Halloween-inspired touch to turn Alice's story into a frightful presentation of vibrantly dark colors. Add his go-to star Johnny Depp as the Mad Hatter and wife Helena Bonham Carter as the wickedest queen in wonderland, Burton as usual created a visual masterpiece. When we meet Alice (Mia Wasikowska) in this latest go-round down the rabbit hole and into the abyss of kookiness, she is trying to dodge her impending nuptials to a man she hardly knows. So naturally she runs away and down the rabbit hole where she comes face to face with evil herself (in the form of The Red Queen), townspeople who look like they've escaped from your worst nightmare, a Mad Hatter and the White Queen (Anne Hathaway) who are the only two with a soft spot for Alice (and help her navigate her Wonderland trip). Alice must figure out 1) how she got to this place and 2) how on earth she's getting out (which doesn't come without its bumps and bruises). 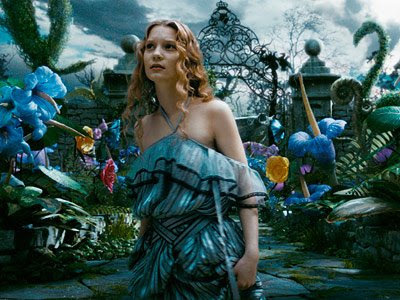 Though visually stunning, Alice In Wonderland is more funny than anything else (thanks mostly to Depp's Mad Hatter). The performances weren't as dark as they should have been given the pairing of Carroll's dark story and Burton's dark imagination. That was quite disappointing. Though Alice In Wonderland was entertaining, the director of darkness needed to step up the dark factor.